Metallica performing live in 2017. From left to right: Lars Ulrich, James Hetfield, Kirk Hammett and Robert Trujillo. Metallica's songwriting is typically led by the band's two founding and constant members: vocalist and rhythm guitarist James Hetfield (top) and drummer Lars Ulrich (bottom). Lead guitarist Kirk Hammett was credited with songwriting on every Metallica album from Ride the Lightning to Death Magnetic . Metallica's original lead guitarist Dave Mustaine co-wrote a number of the band's early songs. Bassist Jason Newsted joined in 1986, performed on four studio albums and co-wrote three songs. Producer Bob Rock performed bass on St. Anger and was co-credited for writing on all the album's songs. 2008's Death Magnetic was credited to the whole band, including recent addition Robert Trujillo. Metallica collaborated with Lou Reed for the concept album Lulu , which was released in 2011. Metallica have recorded cover versions of a number of songs by English group Diamond Head. 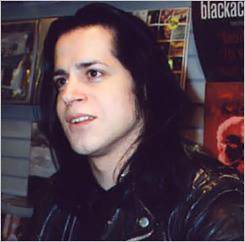 "Die, Die My Darling" and "Last Caress/Green Hell" are Misfits covers originally written by Glenn Danzig. "Creeping Death" contains a cover of "Blitzkrieg", originally recorded by the band of the same name. The $5.98 E.P. : Garage Days Re-Revisited contains a recording of the Killing Joke song "The Wait". Metallica released covers of four Motörhead songs in 1996. A cover of Anti-Nowhere League's "So What?" has been included on a number of Metallica releases. The 1998 cover album Garage Inc. includes cover versions of songs originally recorded by (top to bottom) Black Sabbath, Bob Seger, Nick Cave and the Bad Seeds, Mercyful Fate, Blue Öyster Cult, Thin Lizzy, Lynyrd Skynyrd and more. The "St. Anger" single contained cover versions of five songs by punk rock band Ramones. Metallica contributed "The Ecstasy of Gold" by Ennio Morricone to We All Love Ennio Morricone . Metallica contributed a cover of Iron Maiden's "Remember Tomorrow" to the tribute album Maiden Heaven . Ray Davies featured Metallica on a recording of "You Really Got Me" included on See My Friends . The band recorded a cover of "When a Blind Man Cries" for a Deep Purple tribute album released in 2012. "Ronnie Rising Medley" is a medley of Rainbow songs recorded in tribute to vocalist Ronnie James Dio. Name of song, writer(s), original artist, original release, and year of release.
" The Day That Never Comes "
" The God That Failed "
" The Judas Kiss "
" The Memory Remains "
" The Unforgiven II "
" The Unforgiven III "
1 2 3 4 5 Erlewine, Stephen Thomas. "Metallica: Biography & History". AllMusic . All Media Network . Retrieved December 10, 2015. 1 2 3 4 5 6 7 8 9 10 11 Huey, Steve. "Kill 'Em All - Metallica: Songs, Reviews, Credits". AllMusic . All Media Network . Retrieved December 10, 2015. 1 2 3 4 5 6 7 8 9 Huey, Steve. "Ride the Lightning - Metallica: Songs, Reviews, Credits". AllMusic . All Media Network . Retrieved December 10, 2015. 1 2 3 4 5 6 7 8 9 Huey, Steve. "Master of Puppets - Metallica: Songs, Reviews, Credits". AllMusic . All Media Network . Retrieved December 10, 2015. 1 2 3 4 5 6 Huey, Steve. "The $5.98 E.P. : Garage Days Re-Revisited - Metallica: Songs, Reviews, Credits". AllMusic . All Media Network . Retrieved December 10, 2015. 1 2 3 4 5 6 7 8 9 10 Huey, Steve. "...And Justice for All - Metallica: Songs, Reviews, Credits". AllMusic . All Media Network . Retrieved December 10, 2015. 1 2 3 4 5 6 7 8 9 10 11 12 13 Huey, Steve. "Metallica - Metallica: Songs, Reviews, Credits". AllMusic . All Media Network . Retrieved December 10, 2015. 1 2 3 4 5 6 7 8 9 10 11 12 13 14 15 Erlewine, Stephen Thomas. "Load - Metallica: Songs, Reviews, Credits". AllMusic . All Media Network . Retrieved December 10, 2015. 1 2 3 4 5 6 7 8 9 10 11 12 13 14 Erlewine, Stephen Thomas. "Reload - Metallica: Songs, Reviews, Credits". AllMusic . All Media Network . Retrieved December 10, 2015. 1 2 3 4 5 6 7 8 9 10 11 12 13 14 15 16 17 18 19 20 21 22 23 24 25 26 27 28 29 30 31 32 33 34 35 36 37 Erlewine, Stephen Thomas. "Garage, Inc. - Metallica: Songs, Reviews, Credits". AllMusic . All Media Network . Retrieved December 10, 2015. 1 2 3 4 5 6 7 8 9 10 11 12 Loftus, Johnny. "St. Anger - Metallica: Songs, Reviews, Credits". AllMusic . All Media Network . Retrieved December 10, 2015. 1 2 3 4 5 6 7 8 9 10 11 Erlewine, Stephen Thomas. "Death Magnetic - Metallica: Songs, Reviews, Credits". AllMusic . All Media Network . Retrieved December 10, 2015. 1 2 3 4 5 Erlewine, Stephen Thomas. "Beyond Magnetic - Metallica: Songs, Reviews, Credits". AllMusic . All Media Network . Retrieved December 10, 2015. 1 2 3 4 5 6 7 8 9 10 11 Deming, Mark. "Lulu - Metallica/Lou Reed - Metallica: Songs, Reviews, Credits". AllMusic . All Media Network . Retrieved December 10, 2015. ↑ Morton, Luke (November 10, 2016). "The track-by-track guide to Metallica – Hardwired... To Self-Destruct". Metal Hammer . TeamRock. Retrieved November 10, 2016. 1 2 Torreano, Bradley. "We're a Happy Family: A Tribute to the Ramones - Various Artists". AllMusic . All Media Network . Retrieved December 10, 2015. 1 2 "Kill 'Em All". Metallica Official Website. Blackened Recordings. Retrieved December 10, 2015. 1 2 "Creeping Death". Metallica Official Website. Blackened Recordings. Retrieved December 10, 2015. ↑ "Am I Savage?". Metallica Official Website. Blackened Recordings. Retrieved November 17, 2016. ↑ "Atlas, Rise!". Metallica Official Website. Blackened Recordings. Retrieved November 10, 2016. ↑ "Eye of the Beholder". Metallica Official Website. Blackened Recordings. Retrieved December 10, 2015. 1 2 "One". Metallica Official Website. Blackened Recordings. Retrieved December 10, 2015. 1 2 "Harvester of Sorrow". Metallica Official Website. Blackened Recordings. Retrieved December 10, 2015. 1 2 3 4 5 6 7 8 9 10 "St. Anger". Metallica Official Website. Blackened Recordings. Retrieved December 10, 2015. ↑ "Confusion". Metallica Official Website. Blackened Recordings. Retrieved November 16, 2016. 1 2 3 4 "Hero of the Day". Metallica Official Website. Blackened Recordings. Retrieved December 10, 2015. ↑ "Dream No More". Metallica Official Website. Blackened Recordings. Retrieved November 16, 2016. 1 2 Leonard, James. "We All Love Ennio Morricone - Ennio Morricone: Songs, Reviews, Credits". AllMusic . All Media Network . Retrieved December 10, 2015. ↑ "Halo On Fire". Metallica Official Website. Blackened Recordings. Retrieved November 17, 2016. ↑ "Hardwired". Metallica Official Website. Blackened Recordings. Retrieved October 7, 2016. ↑ "Here Comes Revenge". Metallica Official Website. Blackened Recordings. Retrieved November 17, 2016. ↑ "Mission: Impossible 2 [Original Soundtrack] - Original Soundtrack". AllMusic . All Media Network . Retrieved December 10, 2015. 1 2 "The Unforgiven". Metallica Official Website. Blackened Recordings. Retrieved December 10, 2015. ↑ "Lords of Summer". Metallica Official Website. Blackened Recordings. Retrieved December 10, 2015. ↑ "ManUNkind". Metallica Official Website. Blackened Recordings. Retrieved November 16, 2016. ↑ "Mercyful Fate". Metallica Official Website. Blackened Recordings. Retrieved December 10, 2015. ↑ "Moth Into Flame". Metallica Official Website. Blackened Recordings. Retrieved October 7, 2016. ↑ "Murder One". Metallica Official Website. Blackened Recordings. Retrieved November 17, 2016. ↑ "Now That We're Dead". Metallica Official Website. Blackened Recordings. Retrieved November 16, 2016. ↑ "Until It Sleeps". Metallica Official Website. Blackened Recordings. Retrieved December 10, 2015. ↑ Huey, Steve. "...And Justice for All [Japan Bonus Track] - Metallica: Songs, Reviews, Credits". AllMusic . All Media Network . Retrieved December 10, 2015. 1 2 "Maiden Heaven: A Tribute to Iron Maiden - Various Artists: Songs, Reviews, Credits". AllMusic . All Media Network . Retrieved December 10, 2015. ↑ "Ronnie Rising". Metallica Official Website. Blackened Recordings. Retrieved December 10, 2015. ↑ Monger, James Christopher. "A Tribute to Ronnie James Dio: This Is Your Life - Various Artists: Songs, Reviews, Credits". AllMusic . All Media Network . Retrieved December 10, 2015. ↑ "Sabbra Cadabra". Metallica Official Website. Blackened Recordings. Retrieved December 10, 2015. ↑ "Metallica". Metallica Official Website. Blackened Recordings. Retrieved December 10, 2015. ↑ "Sad But True". Metallica Official Website. Blackened Recordings. Retrieved December 10, 2015. ↑ "Spit Out The Bone". Metallica Official Website. Blackened Recordings. Retrieved November 17, 2016. ↑ "Enter Sandman". Metallica Official Website. Blackened Recordings. Retrieved December 10, 2015. ↑ Heilman, Dan. "Rubaiyat: Elektra's 40th Anniversary - Various Artists: Songs, Reviews, Credits". AllMusic . All Media Network . Retrieved December 10, 2015. ↑ Phares, Heather. "Biker Boyz - Original Soundtrack: Songs, Reviews, Credits". AllMusic . All Media Network . Retrieved December 10, 2015. ↑ Bush, John. "Presents G.H.E.T.T.O. Stories - Swizz Beatz: Songs, Reviews, Credits". AllMusic . All Media Network . Retrieved December 10, 2015. 1 2 Heaney, Gregory. "Re-Machined: A Tribute to Deep Purple's Machine Head - Various Artists: Songs, Reviews, Credits". AllMusic . All Media Network . Retrieved December 10, 2015. 1 2 Erlewine, Stephen Thomas. "See My Friends - Ray Davies: Songs, Reviews, Credits". AllMusic . All Media Network . Retrieved December 10, 2015.